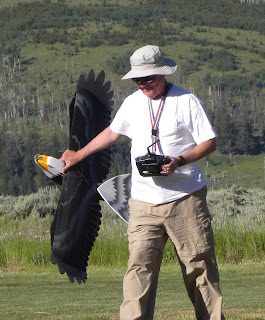 On Friday, Bill and I went to Silverthorne in the Colorado Rockies to attend an RC airplane event at the Teke family farm and flying field. 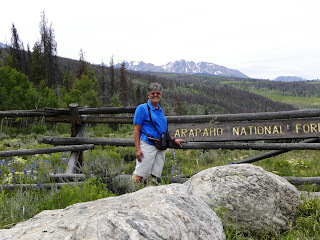 After checking in to our motel, we went to the Columbine Ranch, part of the vast Arapaho National Forest, for a hike and to locate a geocache. 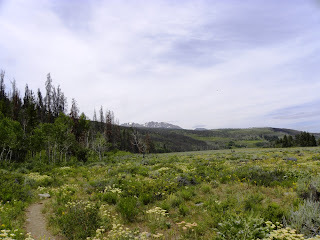 The fields of wildflowers were amazing! Look at the view in the background. 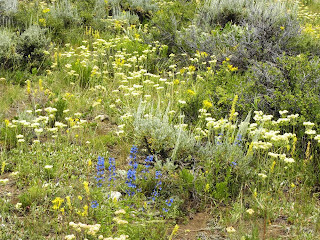 The trail began as a nice easy walk through sage brush and flowers. 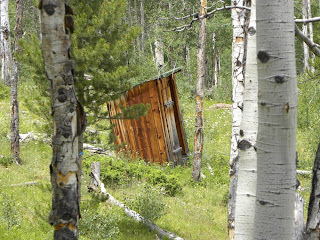 We climbed 100 feet on the last leg of the walk - passing this outhouse on the way. 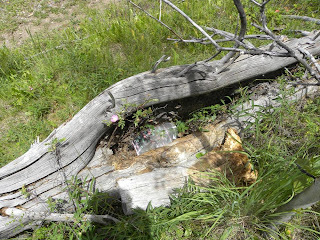 The cache was just off the trail hidden in the fork of a fallen tree. We signed the log, took a yo-yo and left a token. 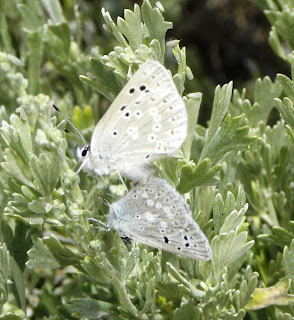 We saw several beautiful and colorful moths playing in the wildflowers. 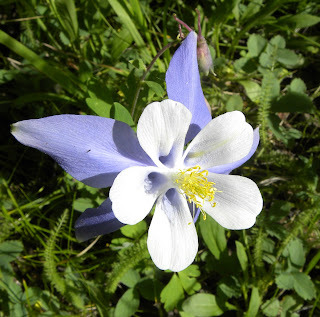 Our two mile hike at the Columbine Ranch was really just an easy stroll so we decided to look for another cache. The Eagles View cache was located at the top of a half mile trail (with an elevation gain of over 300 feet) winding through a beautiful pine forest. The view at the top was awesome. 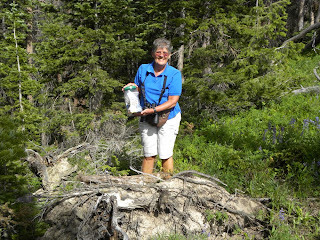 We easily located the cache, signed the log and headed back down the steep hill. 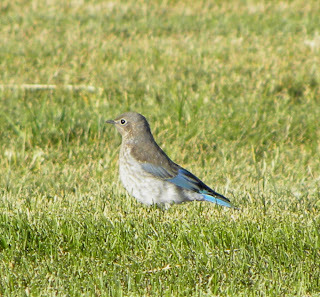 We had a delicious picnic dinner before checking out the flying field and returning to our motel for the night. Very early on Saturday morning we headed to the Teke's. 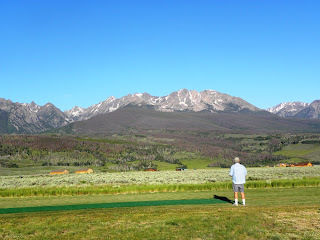 This is the grass runway and the view of the mountains. 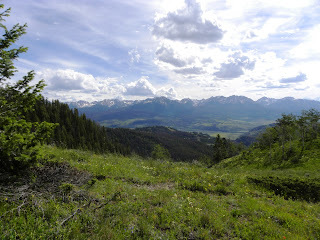 Through my binoculars, I could see a herd of elk on the side of the mountain. Some attendees camped on the 40 acre property and others began arriving shortly after we got there. It was a beautiful day and conditions for the electric planes and gliders were perfect. 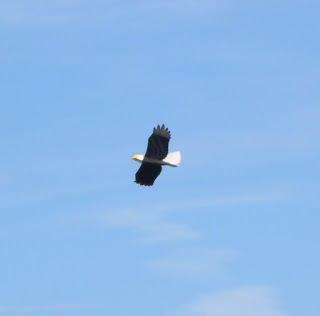 This looks like a Bald Eagle - but it is just one of the many planes we saw fly. Our hosts, Ron and Tanya Teke spent their day cooking. 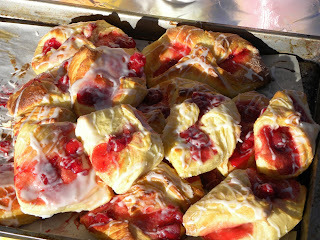 These homemade cherry danish were served for breakfast. Lunch included pulled pork, brisket, sausage, cole slaw, baked beans and a variety of homemade pies. Yum. A flock of Lazuli Buntings called the farm home. There were small rodents popping out of burrows everywhere. 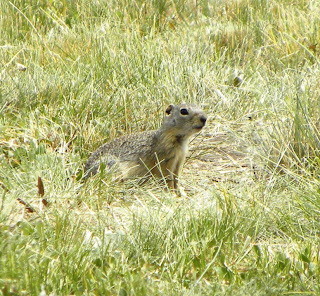 Some people called them pocket gophers - others said they were Richardson's Ground Squirrels. 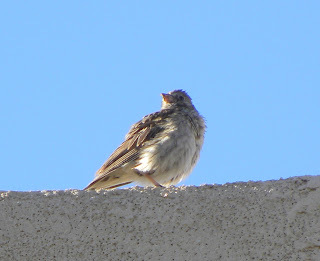 This juvenile Horned Lark was singing on top of the house. Teke's dog, Leslie. She was a cross between a beagle and a lab and looked like a very small lab. Her personality was also more like a lab as she did not bark or howl. Nice pet. We spent two days at the RC meet and met some really great people. 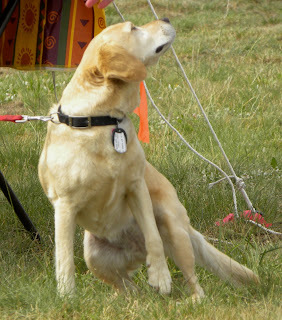 Bill crashed one of his planes, could not get another to taxi on the grass runway and successfully flew a third plane. We ate more than our share, enjoyed the weather and the view, and bought 2 bottles of insect repellent to try and keep the very annoying deer flies away. If invited back, we will not miss this meet in the future! 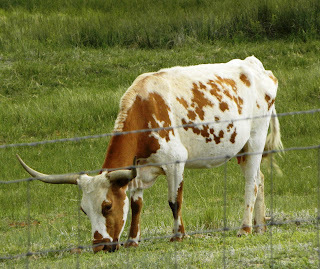 On the way home we saw longhorn cattle and buffalo grazing along the side of the road. 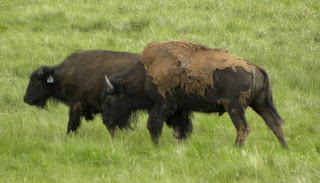 They were an excellent excuse to get out of the car and stretch our legs.